Dog ear infection (External Otitis) is fairly common in Cocker Spaniels. Read on to learn about specific ear problems in dogs: their common causes and symptoms, and how you can help to keep your Cocker Spaniel's ears healthy and infection free. I'm often asked, 'What's causing my dog's ear problems? Well...in a nutshell...it's the design of their droopy ears - the trade mark of this lovely breed - and because they hang low over the entrance to the ear canal the air can't circulate properly. And to make matters worse, there's often excess hair growing just inside the ear, as well as on the outside, both of which go to foster a warm, damp environment, which is an ideal breeding ground for bacteria! There are many other causes of infection in Cocker Spaniel ears, but most of them may be avoided simply by ensuring good hygiene, knowing what symptoms to look for and regular checks. Don't wait until your dog's ears smell rank or you catch him frantically scratching at the side of his head, by then it may be too late and infection may have already set in. Check your pet's ears after he's been romping in the fields and make sure you remove every last seed, bur or blade of grass, and if he's been swimming, make sure you clean and dry his ears thoroughly. Cleaning your dog's ears regularly, and as part of his grooming routine, will help to stop a build up of wax, which if left untreated could cause compaction (making it difficult to get any treatment to work effectively) and further bacterial problems. The more common ear problems are listed below. Otitis Externa is an inflammation of the external ear canal. There are many reasons why dog's ears become inflamed, but generally it's caused by infection from bacteria and/or yeast. Symptoms of Otitis Externa may include sensitivity caused by pain, inflammation, head shaking, scratching the ears, and/or a waxy discharge which can smell pretty awful. Treatment depends upon the diagnosis, and how soon it's diagnosed. Obviously, the earlier the better, but usually your vet will prescribe an ointment to control the bacteria and/or yeast. If you'd like to know a little about natural health remedies for infection and many other health issues, just follow the link. Ear Mites - Dog Ear Infection or Infestation? Ear mites, (Otodectes Cynotis) not so much an infection as an infestation. Mites are tiny crab-like creatures that infest your Cocker Spaniel's ears, and they can be very easily passed on to other dogs. Symptoms of ear mites include your Cocker shaking his head, scratching his ears, and you may also notice an increase in ear wax. If you think your dog has mites, you may be able to confirm this by removing and inspecting the wax from his ears. The mites leave a dark residue of dried blood (which look like little specks of black grit or coffee grains) in the ear. Although ear mites can be difficult to see, in strong lighting they may show up as tiny white specks, but you'll need good eyesight as they're very small. If you suspect your Cocker has ear mites, make an appointment with your vet who will be able to confirm your suspicions and prescribe a suitable course of treatment. 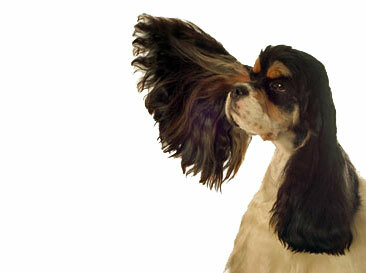 Bacteria and yeast thrive in warm, dark, humid places such as the ear canal, and the Cocker Spaniel's long floppy ears provide exactly what they need to thrive. Whilst most dogs will have safe levels of bacteria already present in their ears; a change in the temperature or moisture levels in the ear can cause these micro-organisms to multiply, can attract other bacteria, and can cause ear infection. Symptoms of a bacterial infection are similar to those seen in other ear diseases, such as shaking of the head, tilting the head to one side (as though listening), scratching the ears, inflammation of the ear, a malodorous discharge, and in serious cases, hearing loss. If you suspect your Cocker Spaniel has a problem with his ears the best thing you can do for him is to take him to see his vet immediately. Please don't try to tackle the problem yourself. Grass seeds and plant matter can work their way into your dog's ear, poor air circulation and increased humidity levels, and an accumulation of wax in the ear can cause ear canker. In the plant world, a canker is a fungal disease, but in dogs it can cause ulcers. showing signs of pain and irritation. In the very worst of cases, especially if it's not treated quickly and properly, there may be risk of death, so it's essential that you leave the diagnosis and treatment to your vet. An allergy will often manifest itself in your dogs ears, causing him to scratch...and scratch...and scratch! This continued and often frenzied scratching can inflame the skin on the ear's delicate lining, or your pet may accidentally tear his skin with his claws while scratching. Inflammation increases the temperature and moisture levels in the ear providing a warm and cozy habitat where bacteria can grow and multiply unchecked. Your Cocker Spaniel may have an allergic reaction to something that he eats, or he may have an allergy to grass seeds or pollen. Whatever the cause, allergies can be very difficult to diagnose. If you suspect your Cocker Spaniel has an allergy, I recommend you have a chat with your vet who will be able to advise you on the best course of action. Cocker Spaniel ears are prone to many infections and they can be really stubborn to treat. It's essential that you check them regularly and take your pet to see his vet as soon as you spot any symptoms of ear infection in your Cocker, otherwise you may find it can take many months to clear up. It took 6 months of bi-weekly visits to the vet and several different treatments, including 3 lots of ear flushing (for which he had to be anesthetized each time!) before Max was clear. Not only was that painful for Max, it was also painful on the pocket too! That was around three years ago. I now check his ears after every walk and I clean and brush them thoroughly every week and we've never had any problems since. 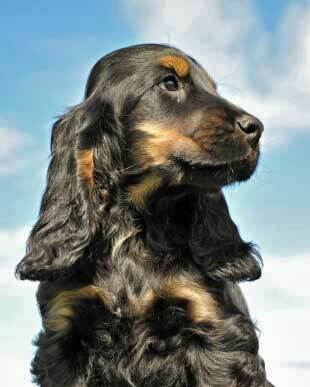 Learn how to spot the tell-tale signs of ear infection in your Cocker Spaniel.